This projet is awesome ! Quite a challenge to fit different components in such a small space. Do you have any PCB left by any chance ? If so I'd like to buy one from you. I recently sold the last PCBs of the initial order. Since there seems to be a steady demand, I'm considering ordering a second batch in the near future. Stay tuned! I think I got a spare pcb left. Some parts as well iirc (mcu, ir receiver, ...). I will check this evening. oi me too. would definitely get one or two if you do a second run! Alright well here's an initial interface idea that doesn't involve complicated timing. When you enter the watch app, there's an empty buffer of 6 chars into which you will type in DOTs and DASHs. As you type in DOTs, DASHs, the (stripes,bell,PM,24h,lap, backwards6) indicator lights come on, indicating how much of the buffer is filled. As you type, one of the top-row segment displays shows the alphanumeric the buffer represents in morse code right now. Once you've typed the char you want into the buffer, hit the Bottom Left button and the alphanumeric goes into the calculator stdin. If you screw up typing the DOTs and DASHs for the alphanumeric you want, fill the rest of the buffer up to 6 chars and the next char goes into the start of a totally reset buffer. Can't wait to get some actual hardware to try this out on. Great to see people using pluto as a platform to implement the features they need on a watch. I've had this idea on my mind as well, but dismissed it as not useful enough / too fiddly too operate. If you're looking for a more practical watch to implement a calculator on, maybe Travis Goodspeed's goodwatch https://github.com/travisgoodspeed/goodwatch is the thing for you. Going to make one of those next. 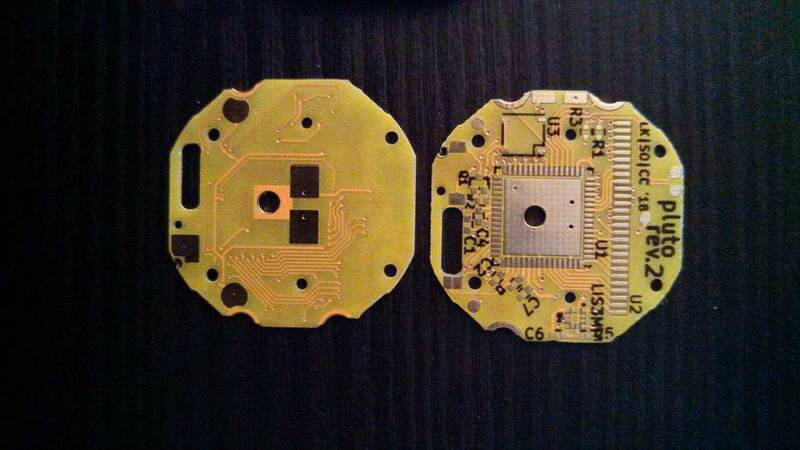 Do you (or does anyone else) have any left over PCBs I can buy or should I order my own? - Made a new board layout that replaces the now-obsolete MAG3110 magnetometer with a LIS3MDL. New layout is probably terrible for reasons over my head, it's the first time I've ever opened a board editor. - Updated the target HAL for the LIS3MDL. Boards just came today from elecrow. The yellow looks pretty cool IMO. Should have time to solder them up this weekend. I might also write a metronome app, it might actually be useful. Does anyone have extra PCBs you'd be willing to part with?